The Macclesfield, Bollington & Marple Railway was born of an idea from Thomas Oliver, owner of Waterhouse mill, and enacted by parliament, receiving the Royal Assent on 14th July 1864. It ran between those three places, opening for goods in 1869, and for passengers in 1870, and was closed under the Beeching reorganisation of the late 1960s. 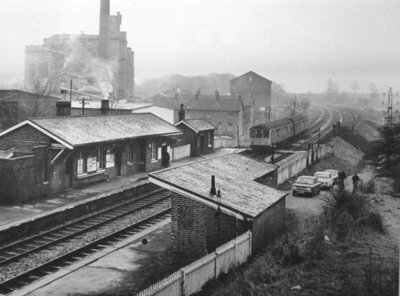 The last train was the 10.30pm from Macclesfield to Manchester on Saturday 3rd January 1970. A later train passed through the station just before midnight, without stopping, on its way back to Macclesfield. The definitive history of this branch line, The Macclesfield, Bollington & Marple Railway, has been written by local historian Basil Jeuda. Though now out of print, copies are regularly for sale on eBay. 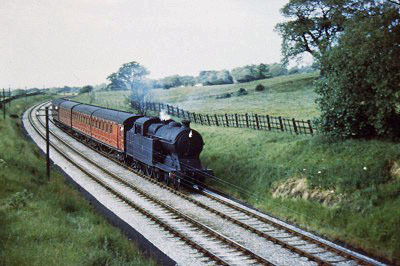 Tim Boddington has discovered an old film, possibly shot by Eric Wainwright in 1969, showing the view from the train as it travels from Bollington to Macclesfield, then returning to Rose Hill, Marple, and on to Marple aqueduct on the lower Peak Forest canal. The film was taken in the months up to closure of the railway on 3rd January 1970. The film is in colour but silent. Click here for a link to the film on Youtube . Some years after closure, in 1981 Macclesfield Borough Council (MBC) were looking for additional recreational space and a closed railway had the advantage of providing an extensive area for recreation and nature conservation, as well as providing the facility over an extensive part of the borough, 14 miles of it in fact, without the need to occupy any farmland. The rail bed was bought by MBC for £1 and a major programme was undertaken to make it fit for public use – fences, ditches, bridges, paths, and to bring under control the overgrowth of nature which had, even in so few years, grown so extensively as to make walking the course of the railway a difficult proposition. 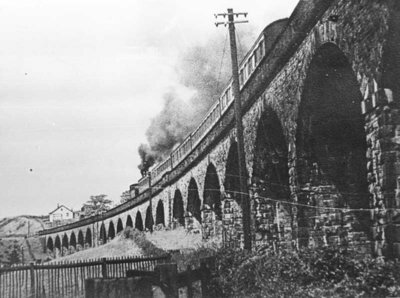 The biggest problem with the railway was the biggest structure on the railway – the 19 arch viaduct across the river Dean valley at Bollington. MBC decided in their wisdom that the best solution would be to knock it down. Well, as you may imagine, Bollington, as a community with one mind, put up a very strong resistance to this idea and ultimately good sense prevailed and the viaduct was maintained rather than demolished. The Middlewood Way is now a very popular cycling, horse riding and walking route, where opportunities abound to watch nature and find a huge variety of plant life. Over much of its length, it runs close to the Macclesfield Canal and there are many places where it is a simple matter to walk between the two. At the Macclesfield end the first mile of the railway was taken over for building the Silk Road; the original rail yard is now the Hibel Road Tesco store and car park. At the Marple end the way leads straight into Marple town centre at Rose Hill station, the only remaining operating feature of the MB&MR. 25. The Railway shall be carried through the property of Messieurs Thomas Oliver and William Creswick Lomas Oliver [Waterhouse mill], by means of a viaduct with open arches, and the Company shall not, at any time hereafter, partially or wholly close up such arches, without the consent in writing of the Local Board of Health for the district of Bollington, and also of the owner or owners, for the time being, of the lands on either side of all the said arches, first had and obtained for that purpose. This is interesting because Bollington Urban District Council were very concerned at the Railway Co.s first proposal which was to build an earth embankment across the valley of the river Dean. Their concern was that foul air from toilets and other sanitary installations would become trapped between the canal embankment and the new railway embankment to the serious detriment of the local inhabitants! They wanted arches so that the wind could blow through and ventilate the area. A reasonable concern when you realise that the town wouldn’t have a sewer system for another 40 years! Three Bollington industrialists were prominent in the development of the railway. Thomas Oliver, owner of Waterhouse mill, first promoted the scheme that lead to the parliamentary authorisation of the railway. John Upton Gaskell, of Ingersley Hall, was a very early subscriber and subsequently a ‘first director’ of the company. George Swindells, who built Adelphi mill, was a later subscriber and also a ‘first director’ of the company. The goods yard, in the background, appears to have been discontinued by this time. The local railway historian, Basil Jeuda, is looking for coloured pictures of the Macclesfield, Bollington & Marple Railway for the last decade or two before closure – 1950s and 60s. If you have any pictures or slides from this era please contact the webmaster and I’ll put you in touch! 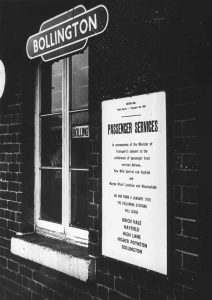 Further history regarding Bollington Railway Station and the Macclesfield, Bollington & Marple Railway (both Wikipedia).